Modern pizza shops bear little resemblance to their predecessors. Big, hot ovens are still needed to move pizzas through the process, but fast-casual pizza is taking a slice out of traditional legacy brands in more ways than one. A recent Harris Poll reveals California-based Blaze Pizza finished second among the best pizza chain brands, behind Papa John’s and ahead of Pizza Hut, which has more than 7,000 locations in the U.S. Blaze also earned the top spot for fastest growth, according to Forbes — it opened more than 220 stores in four years and has another 400 spots secured for the future. These fast-casual spots are marked by an open space dining experience, with eager servers waiting behind an ingredient bar ready to create customizable, fast pizzas with quality ingredients. Fresh, quality ingredients. Rather than weighing down a pizza with artificial colors, preservatives, and flavors, Blaze stays clear of these no-nos based in large part to an awareness of Millennial and Gen Z preferences. CEO Jim Mizes explains that fresh, high quality ingredients makes their food taste better and aids the brand in its relevance and authenticity among today’s consumers. Customization. “Anyway you want it, that’s the way you get it” aptly fits the new fast-casual pizza strategy. Blaze Pizza, as well as MOD Pizza and Pie Five allow customers to wear the chef’s hat to orchestrate their own culinary creations. From traditional to extraordinary, pizza sauces, toppings, and breads at fast-casual pizza shops are differentiating to meet both local and seasonal demands. For example, Blaze’s most recent featured items include roasted butternut squash topping, a roasted squash & quinoa salad, and matcha and blueberry hibiscus agua frescas, reports NRN. Speed. No longer is your wait time dependent on traffic lights and delivery schedules, nor is it dependent on a few cooks and servers trying to jumble a menu of a hundred items. The category fast-casual is as true with pizza as any of the other types of restaurants. Ordering and delivery happen within minutes of each other. Experience. Walk into a Blaze Pizza shop and you feel like you’ve just entered a friend’s kitchen, albeit a very large kitchen. The rustic wood and metal backdrop in the dining area juxtaposes with the busy activity of friendly faces leading guests one-by-one through the ingredients bar. The smell of the high heat oven and baking bread almost makes you forget at the end of the line that payment is still required. Yes, experience matters, even in pizza, and today’s fast-casual restaurants are creating new hotspots for people to eat good food and socialize with friends. National Restaurant News’ latest trend report shows pizza at #8 for 2018. This suggests Blaze Pizza may be positioned to continue its blaze toward the top. 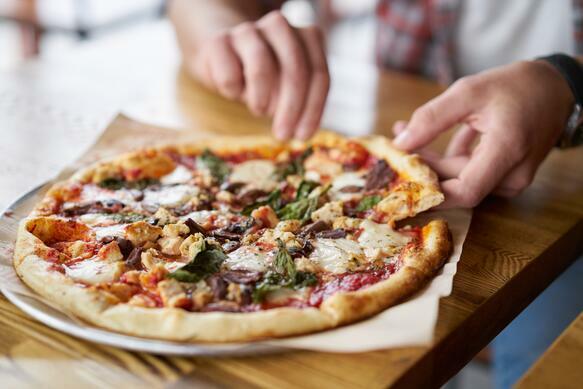 While legacy brands remain the largest stakeholders in pizza food service, the industry may continue to see fast-casual chains like Blaze and MOD give Pizza Hut and Papa John’s a run for their money.